Coarse fishing is the term used to describe fishing in freshwater for any species of fish apart from salmon and trout. 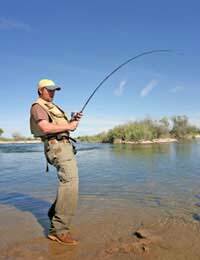 The places to fish are numerous and varied and range from reservoirs to deep rivers and canals. In these venues there are many species of fish. There are small fry such as bleak and gudgeon and there are large fish like pike, carp and barbel. The equipment needed by the coarse angler depends on the conditions and the type of fish being hunted. For the novice angler the equipment needn't be too expensive or complicated. Dedicated carp and pike fishermen use specialised rods that have the strength to handle large bait and powerful fish. Rods used for spinning tend to be small and compact and some have a securing mechanism on the handle to keep the reel in place. For the angler new to coarse fishing, the best choice is a general-purpose float rod. These rods are about 4 metres long and are quite light. They have a flexible action so that the float can be cast out smoothly. A long handle enables the angler to tuck the rod under the arm for more comfort. The most popular reel used by the majority of coarse anglers is the fixed-spool reel. It has a simple arm system that picks up line when the handle is turned. A fixed-spool reel is easy to use and can be bought in different sizes. Larger reels hold more line, which is useful when fishing for barbel or carp. When hooked, these powerful fish will dash for freedom and are capable of stripping metres of line from the reel in seconds. Centre pin reels are sometimes used for float fishing. They have a smooth running action but pulling out line for casting needs practise. Anglers who specialise in catching large pike and huge catfish prefer to use a multiplier reel. However, multiplier reels in the hands of beginners have a tendency to overrun resulting in a tangled mess of knots and loops. For general-purpose fishing a line of 4lbs breaking strain is adequate. The line can hold a fish of more than 4lbs because being in water the fish is supported and therefore lighter. Sometimes, when fishing in strong flowing rivers and streams, the current can add extra "weight" to the fish and test the fishing line to its limit. Barbless hooks are the best choice because they do less damage to the fish and make the job of unhooking much quicker. When using maggots for bait, try a small hook of size 14 or 16. A larger hook is better when using lobworm, cheese or a cube of luncheon meat. Floats are put on the line to carry bait down river or to suspend it in stillwater. Split shot is needed to balance the float in the water so that it stands up and is visible. Legers are the names of weights. Legering is the method used to keep bait on the riverbed or deep in gravel pits. Waterproofs and boots are sensible items to have. A landing net with a telescopic handle can prove useful when bringing in a heavy fish. Keep scissors or nail cutters handy for cutting line and snipping tails off knots. Choosing equipment for the first time can be confusing. Talk to the people in the tackle shop. They are probably anglers and will offer good, friendly advice.